The trial of former President Robert Mugabe’s son-in law Simba Chikore took a dramatic twist yesterday after the State threatened to incarcerate its key witness who refused to answer questions citing privilege. Chikore, who is jointly charged with a Simba Mutimbe, is accused of unlawfully detaining Zimbabwe Airways head of legal Bertha Zakeyo. 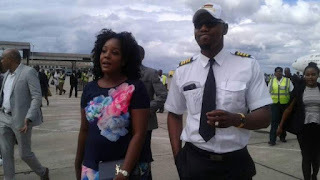 Allegations are that Chikore — married to Mugabe’s daughter Bona —reportedly embarked on a purge of senior staff at Zimbabwe Airways he accused of being disloyal to the company. According to Zakeyo, she received a letter from her boss Chikore, demanding that she responds to a battery of charges levelled against her. The charges included holding unsanctioned meetings outside the company premises and trading sensitive information. She later received an e-mail from Chikore demanding that she writes a report detailing her dealings with unnamed external parties. In a docket opened at Highlands Police Station, Zakeyo said Chikore — whom she accused of masquerading as a captain — kidnapped her for more than two hours and also denied her access to her lawyer, Phillipa Philips. Prosecutor Mirirai Shumba yesterday called Philips to the stand but the lawyer made it clear she will not answer questions. Philips previously wrote to the prosecutors saying she cannot testify against Chikore as they enjoy lawyer-client relationship. “I have a relationship with both the complainant and accused. She is not my client and has never been. “When I arrived at the premises, I was hoping to talk to both parties hoping the matter will not come to this,” Philips said. Presiding magistrate Victoria Mashamba dismissed the State's request to interview Philips who had testified but ruled that lawyer-client privilege does not apply to Philips as the State does not require confidential information. Following the ruling, Philips avoided answering questions and disowned a statement she made to the police which corroborated Zakeyo’s version of events. This prompted Shumba to apply that Philips be declared a hostile witness as she had deviated from her statement.